Grouping of coins from Sweden, Norway, Denmark, Netherlands, Netherlands Antilles, and Netherlands East Indies. The previous owner sorted them and wrote the contents of each bag on scrap paper. I have taken photos of the lists, and looked to be sure that the coins were all there. All in 2X2’s. Quite a few silver coins, I didn’t figure it out, but I believe the ASW is close to 3 ounces, maybe more. A lot of nice minors. While there are not many mint state coins in the group, I only saw a couple that were cleaned, and I’d say 95% are decent collector coins. $110 delivered to US addresses. PayPal, cash, check, etc.. PM me if interested. - SOLD PM me with your email address if you need better photos of the lists. 1929 brown seal $5 National Bank Note from the First WIsconsin National Bank of Milwaukee (Charter #64). The note is all there with no splits or holes. Has folds and the whole note is uniformly a bit darkened by dirt. I would grade it as VG10...maybe F12. $50 delivered. 1929 brown seal $10 Federal Reserve Bank Note. St. Louis (H) bank. Nice note, but has been folded in rights at some point. The printing is not centered. I'd grade it as VF. SOLD Series 1934 $10 Federal Reserve note from the Chicage (G) bank. This note has the vivid lime green seal, but the serial number falls in those listed as having the darker seal. A nice note, I'd grade it as high VF or low XF. $20 delivered. PM me with your email address if interested and I'll send photos. Thanks! Group of two older US coins...an 1845 large cent and a 1866 nickel three cent piece. $10 + $3 shipping to US addresses, more elsewhere. PM me if interested. Group of seven smaller silver coins from the 1800's and early 1900's. The group consists of: 1865 Great Britain shilling (die 54), G+ 1904 Canada 5 cents, F 1905-A Germany 1/2 mark, VF 1874-ST Sweden 25 ore (holed) 1890 MoM Mexico 5 centavos, F/VF but slightly bent because of a hit on the rim 1889 PiR Mexico 5 centavos, VF+ 1896 MoB/G Mexico 10 centavos, VF $20 + shipping...in the US the shipping will be $3.00 - shipping to other places will be actual shipping cost + 50¢ for the padded envelope. PM me if interested. http://i36.photobucket.com/albums/e45/Blackhawkcoins/Mobile%20uploads/image_zpsc8goow3l Does anyone recognize the mint mark on this 1851-61 Hsien-Feng 5 cash from China. Could it be a stylized script of the Cheng-te mint of Chihli? 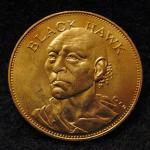 Group of seven low mintage 1951 great Britain pennies. All are unc. and brown, with some having a little red around the devices and lettering. Nice coins. $210.00 delivered for the lot. Attractively toned 1935-A 5 marks from Germany. Photos are of raw coin...it's now in a PCGS MS63 holder. $150.00 delivered. PM me if interested. 1913 Russia 1 kopek. Just about all red, lustrous - $20.00 delivered 1912 Finland 1 penni, red - $10.00 delivered PM me if interested. Set of six 1965 Canada prooflike coins (cent to dollar) in a screw together Capitol holder...I'm not sure what variety of dollar is in the set. The coins are better than average and the silver issues have light toning at the rims. The holder has some masking tape residue on it that could be removed. The silver value on this set is currently a little over $32.00. $35.00 delivered to US addresses...slightly more elsewhere based on actual delivery costs. PM me if interested. I have a coin from Finland that I can't put a price on...although it would seem that there should be some for sale that I could compare it to, apparently there are none currently on the internet, Ebay included. The coin is a 1930 10 pennia, which has the lowest mintage of the series (650,000), but is listed at a fairly low price in guides - the 1931, which has a much larger mintage is listed at a higher price, but again I can't find out much about the coins from that date either. Are these coins that hard to find, or is it a case that there are few collectors out there and thus little demand for them?